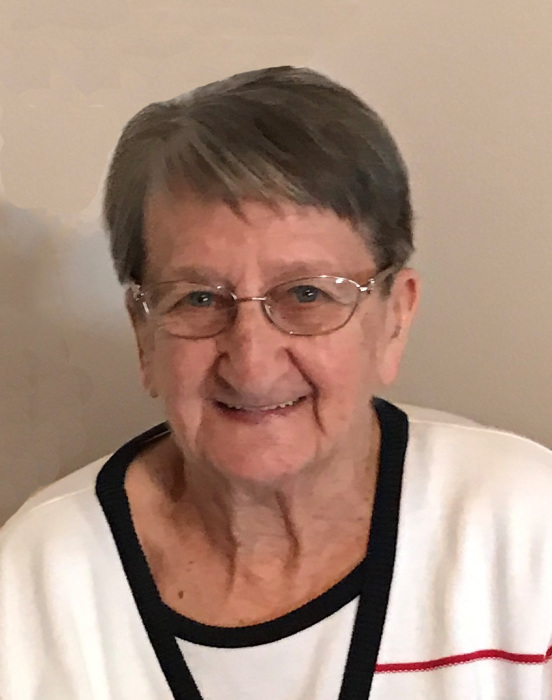 Magdalena (Maggie) Klundt, 92, passed away peacefully at the Sanford Hospital in Bismarck, ND on Saturday, April 13, 2019. Maggie Veil was born July 20, 1926 near Gackle, ND the daughter of John J. Veil and Lydia (Dockter) Veil. She received her elementary education in the local rural school and grew to womanhood in the vicinity where she helped on the family farm. Maggie and Edwin Klundt were married May 25, 1947 at the United Church of Christ in Gackle. They made their home on a farm 6 miles southeast of Gackle where they farmed and raised their two daughters, Linda and Adella. Maggie spent many hours kneading bread dough, making cottage cheese for kase knoepfla, rolling dough for noodles, and preparing other German food. She worked diligently gardening and often helped with field work. In 1989 they moved into Gackle but continued farming for some time. Edwin passed away March 21, 2001. Maggie continued to live in Gackle until 2008 when she moved to Bismarck, ND to be closer to her family. She was a member of the First United Church of Christ in Gackle, ND. She also was a member of the American Legion Auxiliary, Ladies Aid and Progress Homemakers. Surviving are her children, Linda Kovell, Champaign, IL and Adella (Marlin) Schick, Bismarck, ND; 6 grandchildren, Troy (Nicki) Kovell, Paxton, IL, Brandon (Jennifer) Kovell, O’Fallon, IL, Wendy (Tim) Gerlach, Andover, KS; Angela (fiancé Chad) Hamkens, Bismarck, ND, Melisa (Jarod) Bartlett, S Berwick, ME, Jessica (Scott) VanDenBerg, Manchester, NH, and 13 great grandchildren; 4 sisters and 2 brothers, Lenora Labrensz, McLaughlin, SD, Bertha Labrensz, Jamestown, ND, Violet Fischer, Ft. Dodge, IA, Ileene (Nels) Albin, Jamestown, ND, Henry (Marcene) Veil, Jamestown, ND, and Eugene (Virginia) Veil, Bismarck, ND. She was preceded in death by her parents, husband, 2 sisters, Olga Fischer and Esther Unruh, and son-in-law Fred Kovell. Funeral service will be Thursday, April 18, 2019, at 11:00 am at the Haut Funeral Chapel in Jamestown, ND with Rev. Rick Steele officiating. Visitation prior to funeral at 10:00 am. Following the funeral service the family invites you to join them at the St. Paul United Methodist Church for lunch and fellowship. Maggie’s family would like to thank everyone for their presence, kindness, thoughts and prayers during this difficult time.